The New Orleans Saints have traded Kenny Stills to the Miami Dolphins for inside linebacker Dannell Ellerbe and a third round draft pick. Stills’ 2014 season was slowed by injuries, but he has established himself as a legitimate deep threat and demonstrated his ability in the short to intermediate passing game with an impressive 78.8% catch rate ranking fourth among receivers last season. The trade is a bit of a head scratcher for the Saints considering that Jimmy Graham is now in Seattle and Marques Colston isn’t getting any younger. Stills is going on 23, and is slated to make less than $600K, an incredibly friendly cap figure for a team with substantial cap concerns. 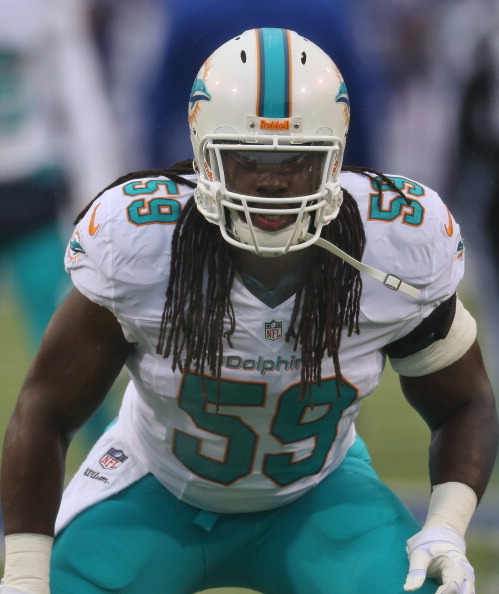 Ellerbe is slated to slide into the staring middle linebacker spot vacated by Curtis Lofton. He also carries a cap figure near $9 million and despite the fact that Ellerbe and the Saints are currently restructuring that deal, he won’t come terribly cheap. We assume the Saints really valued the third round pick. As for Miami, the move nets a young, talented and in-expensive receiving threat and frees up about $4 million in cap space. Ellerbe hasn’t lived up to his contract since signing with the Dolphins in 2013 and would likely have been a Post June 1 cut had it not been for his trade. There has been uncertainty regarding whether or not Mike Wallace will be a member of the team come the start of the 2015 season and this move may be a precursor to the Dolphins’ final decision to part with him. With Jarvis Landry, Jordan Cameron, Charles Clay (for now) and Kenny Stills in the fold, Wallace could very well be on his way out.